Over the past few years, we have seen some of the most innovative tech inventions made. Some have caught people’s interests and have kept them on their toes. One of these tech wonders is wearable tech. Smartwatches are the technologically advanced baby of the traditional watch, the fitness watch, and a smaller, more convenient partner of your mobile. 2012, 2013, 2014, 2015 and so far in 2016 have seen its fair share of companies trying to keep up with this trend. Tech companies, watch companies, even fashion brands have all jumped on the bandwagon of wearable tech. Watches have all been a staple in anyone’s closet, and it is due time they kept up with the latest that technology has to offer. However, not all smartwatches are created equal and we have not yet seen the perfect one. British brand ORSTO challenges this notion and explains why they are one of, if not the best, in the market with that perfect blend of style and function that traditional watch wearers desire to make the transition from traditional watch wearer to smartwatch wearer. ORSTO is the modern day horology atelier you would want to look out for. Introducing new analog smartwatches after a very successful equity investment funding campaign on Crowdcube, ORSTO has taken great pride throwing all of their not insignificant wearable tech expertise into developing one of the most advanced and innovative types of Smartwatches on the market without compromising sophistication, classic style, and function. 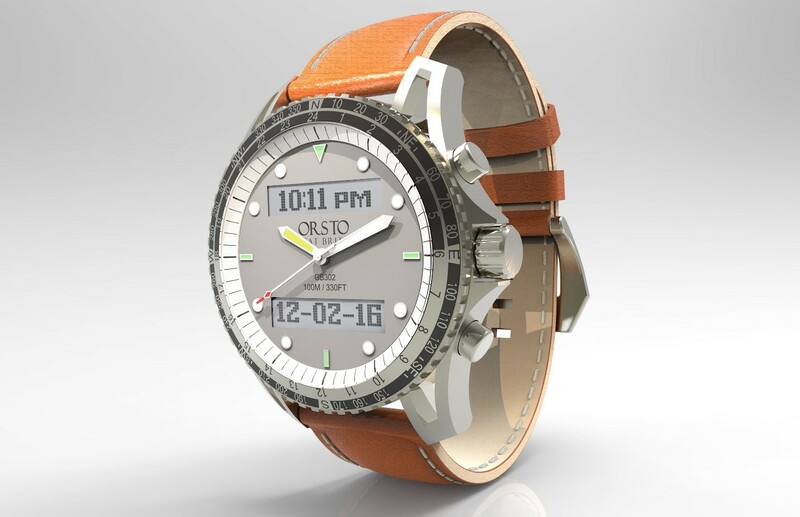 Since the chiming of Big Ben for New Year 2016 ORSTO have released an astounding 4 ranges of Analog Smartwatches. Contemporary 100 Range, Classic 200 Range, Navigation 300 Range and most recently the Diver 400 Range. They even have another Range secretly in development called the Finesse 500 range, which is expected to be their offering aimed specifically at the female watch wearer. Releasing pictures onto their very popular ORSTO social media channels such as Twitter and Instagram has resulted in a massive amount of excitement because of the impressive features and high-quality utilitarian aspect of ORSTO Analog Smartwatches. With its range of timeless Analog Smartwatches, ORSTO has decided to take away the touch screen altogether and stick to traditional wrist watch style and functions, while remaining true to its “smart” features. The watches are compatible with both iOS and Android and can readily notify you of any call, message, alerts, reminders, and alarms you might have on your phone. They can also be used as a camera and music control. For the more active user, all ORSTO Analog Smartwatches boast highly-functioning fitness tracking features including sleep, steps, distance, speed, and even reps during weight training. Unlike other smartwatches that are only splash proof, ORSTO offers proper water resistance features with 100M/330FT water resistance on 3 model ranges and a world’s first for smartwatches being 200M/660FT water resistant on their Diver Range. Battery life just blows your mind. ORSTO has proven itself by providing the best battery life a smartwatch can offer. Unlike its competitors, ORSTO time pieces can live with its fully functioning smart features up to seven months—in comparison to most smartwatches that struggle to last 1 day without having to recharge. While fans of wearable tech have been enjoying their smartwatches, the market for traditional timepieces still prevails, according to ORSTO. Where ORSTO wins is that they have successfully merged the market of traditionalists and tech liberals, giving consumers best of both worlds. The ORSTO Smartwatch is proving to be a worthy competitor and is definitely here to stay. Weddings are those days that most of us remember for the rest of their lives. Do you still remember your wedding day? I bet that you did, even if you have been married for many years now. One of the reasons we remember our wedding days is that we put so much work and effort in them. After all, we want everything to be perfect on that very special day. We don’t want anything to go wrong. One of the reasons to accomplish it is to be prepared very well for that day many days or even months in advance. As you are probably aware, there are so many things to take care of while planning your wedding. The attention to detail matters here a lot and items such as sparklers with personalised sparkler tags can make all the difference in terms of how your guests and you are going to feel. Everybody loves sparklers, there is no doubt when it comes to that, so why not brighten your day with some personalised sparklers. Adults love them, children love them even more, so they are a great opportunity to add a bit of character and fun to any wedding. I have always been a huge fan of personalised items you might want to use on your wedding day during your reception. If you add some customised items on the table, you communicate to your guests that you care about them and that they are important to you. It is also a chance for you as a bride or groom to make this particular day even more special with all the decorations that are useful and fun at the same time. Feel free to look at the large selection of sparklers available on the Internet and find the ones that suit you most. If you are a parent, you probably worry about the safety of your children from time to time. You want to make sure that they are safe and that nothing bad can happen to them. After all, kids are just kids, and their judgement is often impaired due to their age. Additionally, children can do all sorts of things we grownups wouldn’t even think of, so it is no wonder that we tend to worry about their safety from time to time. If you are concerned about your kids safety, you know that common sense might sometimes not be enough as kids can do many unpredictable things. If this is the case, you might want to check a list of items you might have in your household that cause potential injuries or even deaths. Only that way can you check if you own something that poses a risk on injury or even death in your possession. You will feel like a better parent if you are going to take steps to ensure the safety of your children. One way to accomplish this is to check on a regular basis what products have been recalled lately. This will give you an idea what kind of items pose a hazard to your children. I, for example, never thought that some children could crawl inside a bean bag and then zip it not being able to get out. There are also many other items that look dangerous even though I might have never thought that they were like that. keep checking the list and the news regularly to see how you can make your home a safer place to be, and you are likely to not only feel more at peace, but also make sure that no injuries ever happen in your home.